'That's Unfair!' This Monkey Can Relate : 13.7: Cosmos And Culture It can be exasperating, when life throws a little unfairness your way. When that happens to commentator Barbara J. King, she watches this video featuring an experiment with two monkeys. It helps. 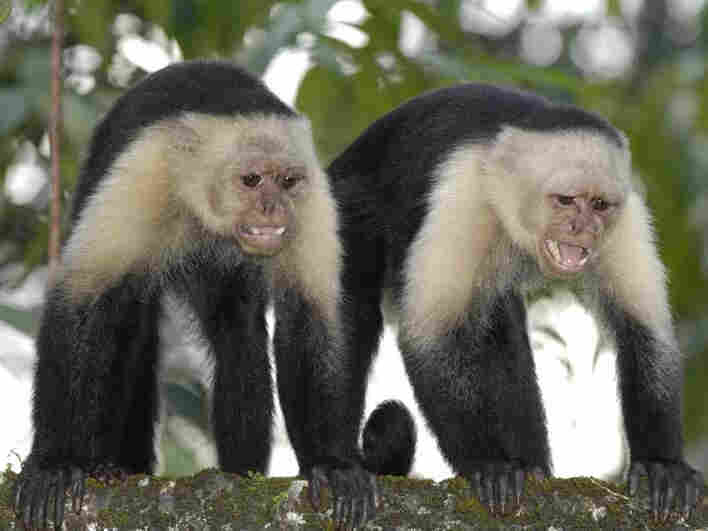 Two white-headed capuchin monkeys (also known as the white-faced capuchin or white-throated capuchin) on Gorgona island, off Colombia's Pacific coast. Every now and then, just once in a while, really, someone asks me to do something unexpected and a little bit onerous, something I feel I shouldn't have to do, and I catch myself muttering: "But that's unfair!" Then, in the next moment, I do two things. I vow never to say it again. It's too much like a whine and I'm not a whiner. Anyway, why should I, a grown-up, after all, expect fairness to be a part of my every hour and every day? As the well-known primatologist Frans de Waal can be heard explaining in that clip — or with a bit more detail in the one that follows this paragraph — capuchin monkeys "get" unfairness. In the filmed experiment, one of the monkeys is originally quite satisfied with a cucumber reward for carrying out a task. But the animal quickly becomes piqued when a second monkey is given a vastly preferable grape reward for carrying out the exact same task. The piqued monkey, in a nonhuman-primate sort of way that looks pretty sophisticated, grasps the situation's unfairness. And it's not just this capuchin monkey, but others as well, as explained by Sarah Brosnan and de Waal in their article from 2003 called "Monkeys reject unequal pay."). Watching those two monkeys in the video, I feel it's OK to be a little less hard on myself for any verbal outbursts about unfairness — maybe it's a primate thing to react in a peeved way when our expectations of fairness are violated. Of course, the human world contains genuinely significant injustices — too many of them. Such inequities are no laughing matter. But I'm not thinking about those here; I mean only the small injustices we all experience on occasion. And in that context, watching those capuchins makes me laugh, and helps me to get over myself.